The sun just keeps shining and the days are hot – That’s the best weather for making wild herb salt and plant drying. Well, it’s also a perfect time for making cocktails and ice cream out of the spruce shoot syrup. 😉 The weather forecasts have been so wrong lately. They’ve promised rain and even thunder but the sky just stays clear and the air hot. Everything is yellow with pine pollen and the muddy paw prints my dog made three weeks ago after a bath in the ditch are still visible on the hot pavement. I decided to make a big jar of wild herb salt from plants that I could easily find close to my home and garden. 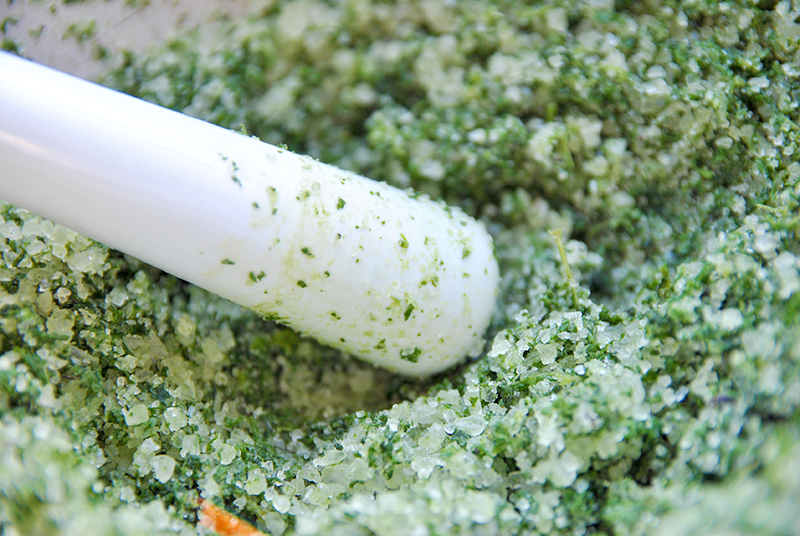 Basically any herbs and tasty plants will do for preparing herb salt. The main idea is that the fresh herbs are ground together with sea salt because the flavors are preserved better in the salt mixture than if the herbs were just dried. Mixing the salt with the herbs will take approximately 45 minutes. At first smash the mixture with a wooden tool that is typically used for making Carelian pies. When the plants started blending with the salt I switched to a ceramic pestle of a mortar. I’ve heard of people mixing up the ingredients in a blender but I haven’t tried that yet (just because I don’t own a blender at the moment). The way I made the salt is traditional but I think that a quick mixing in a blender might do the trick a lot faster. Collect two liters of herb leaves. You can choose which ones to take depending on what is available. Just make sure that if you have plants with both strong and delicate tastes, remember to use the strong ones in moderate amounts. Wash the leaves carefully, remove any dry or hard parts as well as stems. Dry the leaves carefully with a towel. Mix 800 gr of coarse sea salt together with the herbs in a large bowl. Beat and grind them together until the mixture resembles a green paste. You know that the herb salt is ready when you stir the mixture and all ingredients are spread evenly (no salt crumbs stay on the sides of the bowl). Spread the herb salt on baking pans covered with baking paper sheets and place in a warm spot, not in direct sunlight though.